The uniform. Whether you love wearing one or hate it, there are many functions uniforms serve in the restaurant business rather than merely making your employees look presentable. From free branding to team morale, uniforms serve many different purposes. When uniforms are mandatory they may seem like a nuisance to have to wear every day, but in reality, there are strong underlying reasons why restaurants choose to wear a set of standard clothing. Depending on whether you’re a front or back of the house employee, the functions of your uniforms may differ dramatically, while some functions may not be as different as you think. Think about how many times you have been at a restaurant and right after your waiter left your remembered something you wanted to ask him/her. Immediately you grab the next waiter to ask them your question. What would you do if you accidentally asked one of the customers your question, mistaking them for a waiter because the staff wasn’t wearing uniforms? I don’t know how many times I have done this in retail stores, and immediately I felt so bad after for mistaking that person for an employee. Uniforms stop you from making these embarrassing mistakes. When you go into a restaurant and see everyone dressed in jeans and their everyday clothes, the first think that might come to mind is “Okay, this place is casual. The food may not be as good as the five-star restaurant down the street with all the waiters wearing ties – even the females.” Professional uniforms can extremely alter a person’s first impression of a place, which can unconsciously change the customer’s opinions from that point on. If your waiter is dressed clean, crisp, and respectable, the greater chance you are going to feel your waiter is going to do his/her job right. Even before they list off all of the red wines and what they should be properly paired with from the top of their head, you will already feel like you can trust them to efficiently do their job. This includes personal grooming – nobody wants a big bearded man as their waiter, just waiting to get hair in the customer’s food. Aprons: Aprons are great for protecting a waiter’s uniform. They also have pockets where they can keep notebooks, checks, and pens so they can be more efficient with each run they make. Long sleeve shirts: Think about how many times a waiter has to lean over you. Whether it be to give everyone their menus, refill a drink, or take plates out of your way, sometimes it is hard for them not to come a little too close to you. What would make this even worse was if their bare underarm was in front of you, rather than a nice clean shirt. Waiters uniforms have to be designed with the customer in mind. Shoes: While shoes might not always be given to waiters, a specific style and look are sure to be required. Close-toed tennis shoes are typically what the restaurant business requires, along with a consistent color for each employee. Tennis shoes allow for waiters to move quickly and swiftly throughout a restaurant and closed-toe shoes are for their safety. A chef’s hat, for example, can be different heights. The height of each of hat indicates a person’s rank within the kitchen, establishing order. The hats used to be different colors signifying rank but has since been standardized to white to indicate cleanliness. Safety is the biggest concern for back of the house employees. 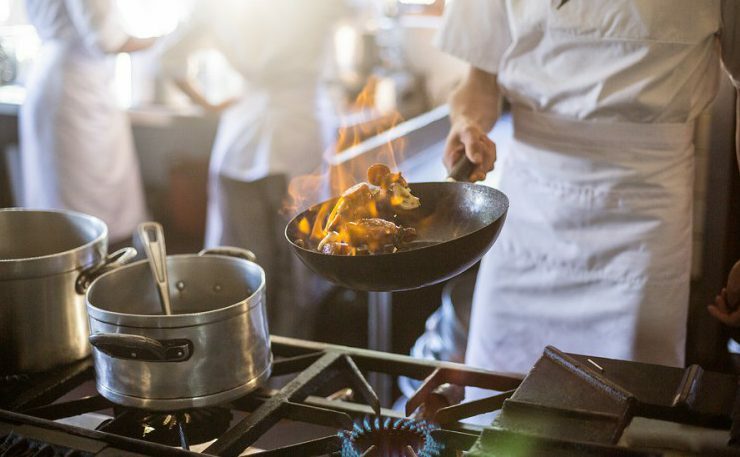 The chef and kitchen staff will be using sharp knives, standing in front of open-flame stovetops, and maneuvering themselves between busy kitchens with high chances of food or drink spills. Each of these pose enormous threats to the staff and their safety, so the uniforms must be specifically designed to protect its employees. Protective Gloves: These are cut resistant gloves, typically used by newer chefs to protect themselves when using sharp knives. Hats: Tall white chef hats were first worn during the 16th century when chefs had to hide from monasteries because they were seen as too creative. Nowadays these hats are worn to signify rank and protect the kitchen staff’s hair from falling into one’s dish. Jackets: A chef’s jacket is made out of double thick cotton to protect the cook from hazards that come with cooking around dangerously hot appliances. Neckerchief: With such hot temperatures in the kitchen, cooks are bound to start sweating. Neckerchiefs help protect sweat from accidentally dripping into food. Apron: Cooking aprons can be much different than aprons waiters wear. In a professional kitchen, aprons are used to protect a chef’s jacket from spillage, heavy duty pockets to keep sharp tools, and can protect the cook from fire if it is made out of flame resistant material. 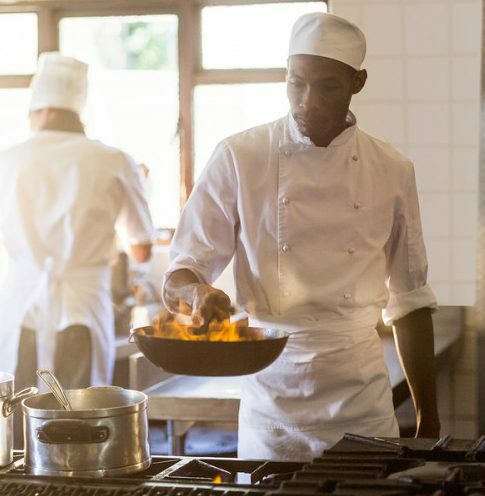 Shoes: While your shoes may not always be provided to you, there are typically guidelines in what type of shoes the chef and cooking staff should wear. Sturdy, comfortable shoes (typically black) should be worn in case a heavy pot, sharp tool, or hot liquid ever fell to the floor. Get FREE Quotes on Purchasing Uniforms in the Restaurant Industry Today! If this has swayed you into purchasing uniforms for your employees, Uniform Nations can connect you to a restaurant uniform provider in your area. Whether you are looking to rent or buy, our partners provide top quality uniforms to keep your employees looking fresh. Find out if purchasing uniforms in the restaurant industry is the right solution for you by calling us today at (866) 467-4178 or by filling out the form to the right. Within minutes of receiving your request, you’ll be provided with a list of free food service uniform quotes from experts near you. 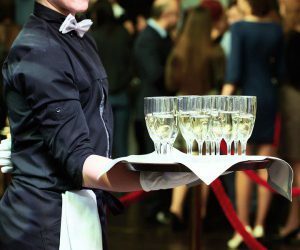 Stretching from protecting your employees from injury to establishing a professional appearance for a national or international brand, this in-depth white paper breaks down the different aspects to the modern restaurant uniform today and the benefit each piece offers—helping restaurants to find the optimal uniforms as well as services for their business.